"It is quite a three pipe problem, ..."
The name "Prince of Wales" was used at times by GBD for a sub-brand. Pipephil shows English made Prince of Wales which bear the Scottish flag (X-shaped cross representing the cross of the Christian martyr Saint Andrew, the patron saint of Scotland) as logo. Also listed by Pipephil is a brand named P.O.W. attributed to a Scottish firm G.M. Frame. Now, if P.O.W. doesn't stand for "prisoner of war", this might be an indication that there are two different Prince of Wales productions. Prince of Wales Made in Italy. 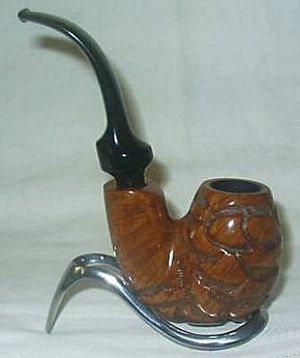 Quotation: "In the spirit of the Bing's Favorite Pipe, Savinelli expands it's line of pipes favored by famous pipesmokers. Prince of Wales Favorite series features a new mosaic designed mouthpiece which gives it a unique look like no other series. This pipe can be used with or without Savinelli balsa inserts (20pk included)." This page was last edited on 29 June 2013, at 04:38. Content is available under these copyright provisions unless otherwise noted.